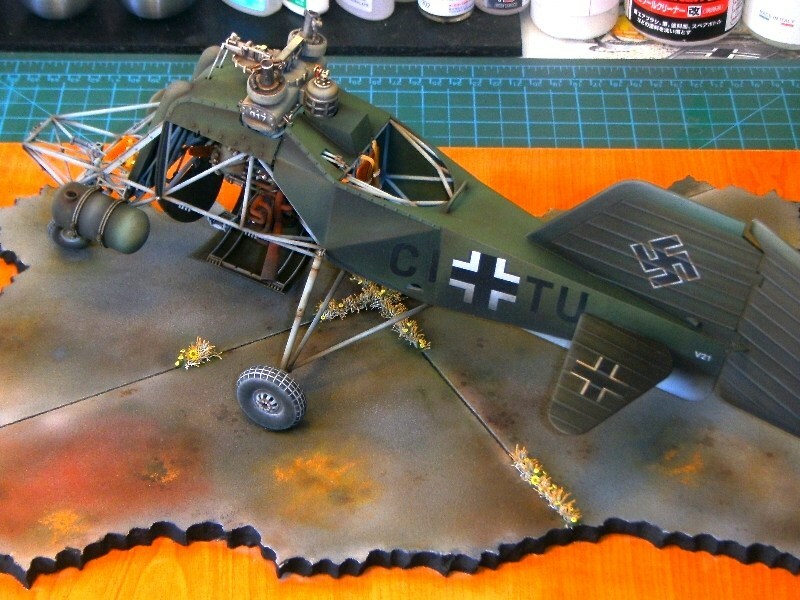 To add some weathered look on fuselage areas (doped fabric covering over the steel & wooden frame on real helicopter) and replicate parts like being dirty, dusty or sunfaded, I appplied different shades of dark brownish pigment powder, trying to blend them nicely to look artistically accepted and create 3D-alike effects on flat surfaces. 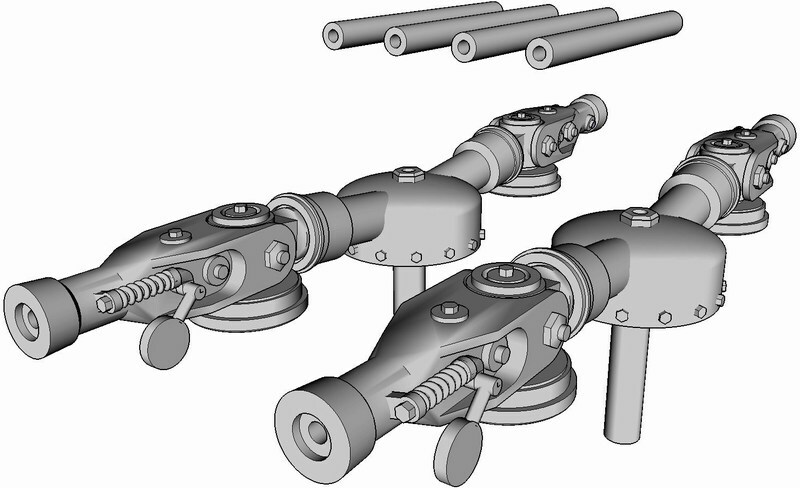 The results on model may not look so “strictly realistic” comparing to the real world objects, but IMHO scale modeling has to balance between realism factor and artistic expression. 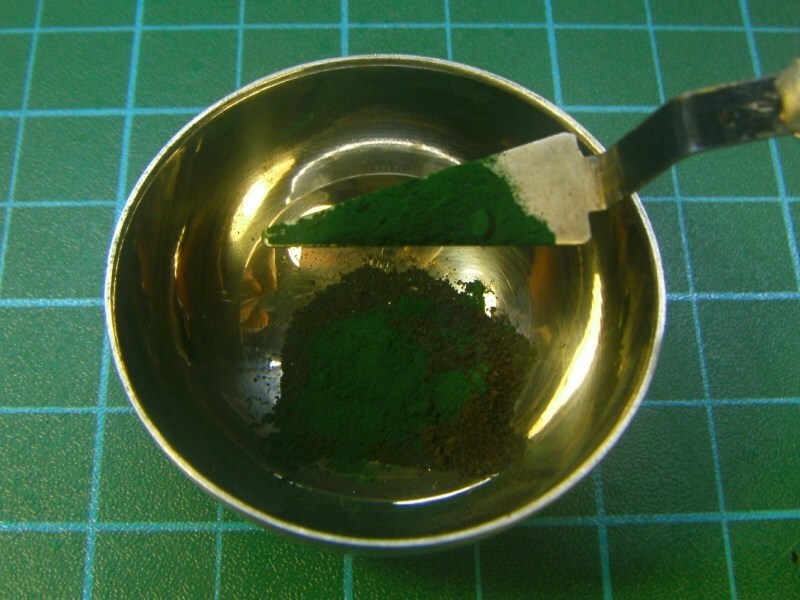 I admit that adding (extensively in some specific areas) pigment powder, may not accurately replicate the reality, but it looks artistically attractive and becomes easily accepted by visual subconscious. 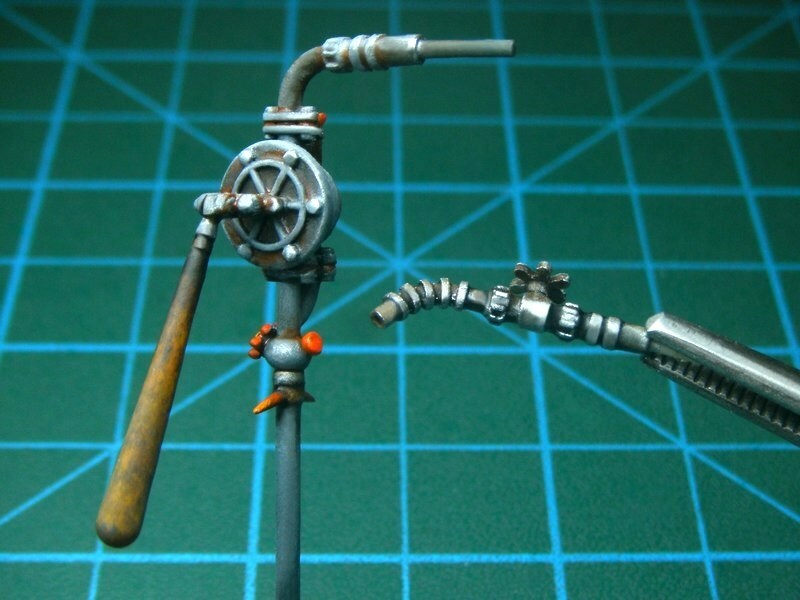 The main advantage of the pigment powder shades is that the already painted scale model gets some nice weathering / lighting effect tones. 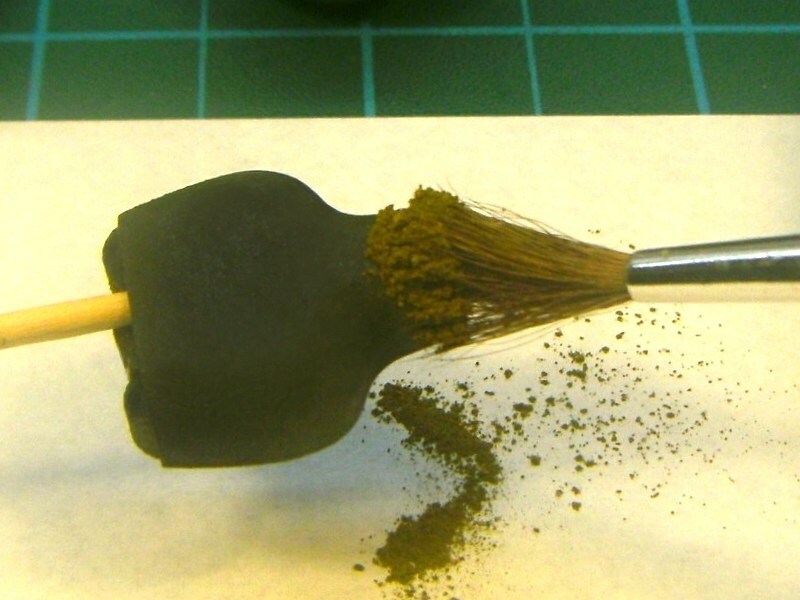 On the other hand, the big disadvantage is that once the pigment powder settles on the model’s surface, it should not be touched to avoid smudging. 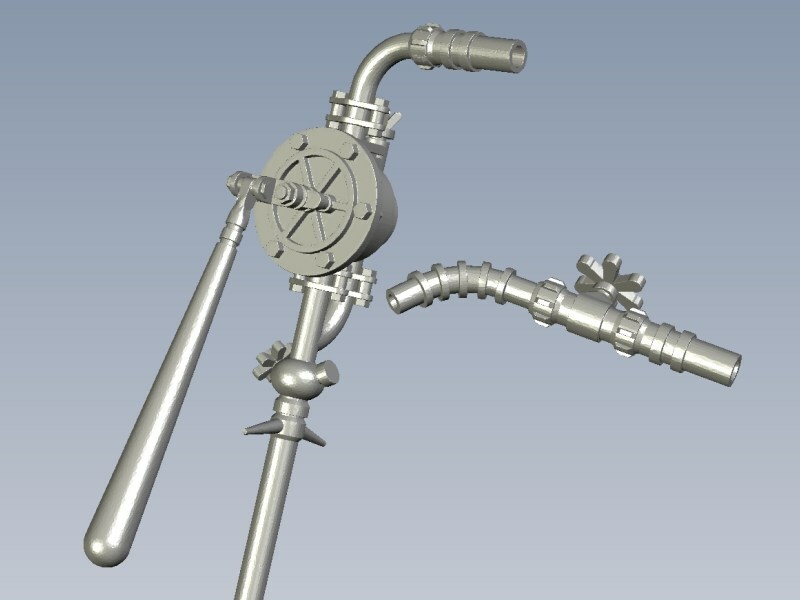 To overcome this problem, modelers usually secure the pigment in place by carefully soaking the model surface with modeling fixer. However, even after applying modeling fixer, it is not absolutely safe to touch the model. I tried a different approach and used Winsor & Newton’s fixative for charcoal & pastels (instead of modeling fixer) over pigments. 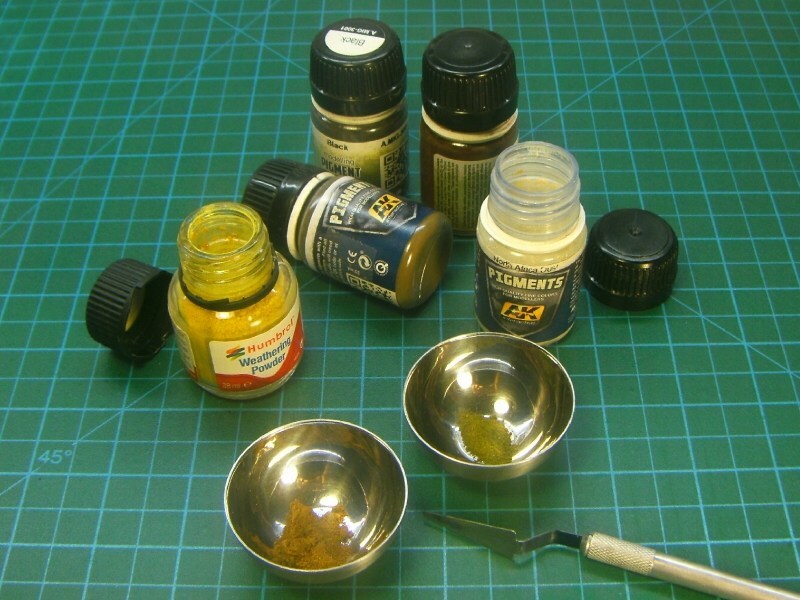 Although similar, the Winsor & Newton’s fixative is different from the modeling fixer. 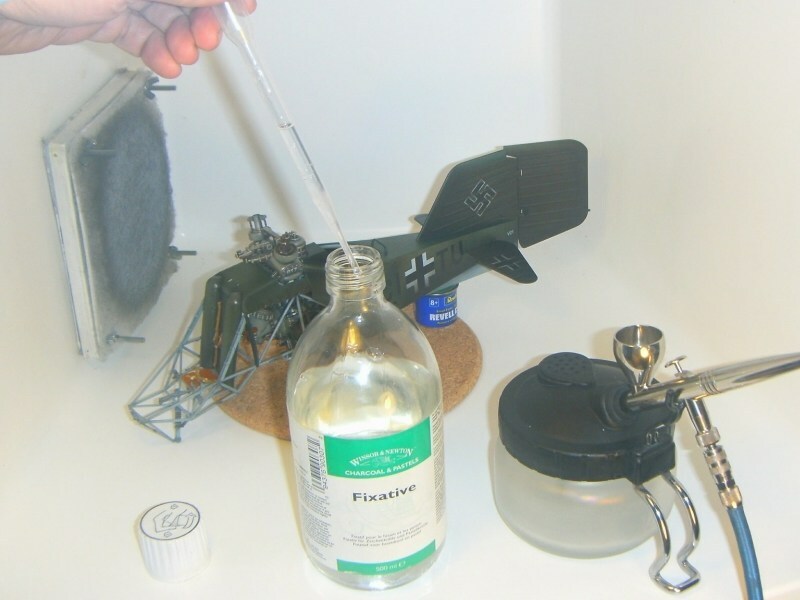 The Winsor & Newton’s fixative solution (available in 75ml and 500ml bottles) provides protection of charcoal, pencil, pastel & chalk drawings - it is mostly used by painters & pastel artists to seal the final result of their work. 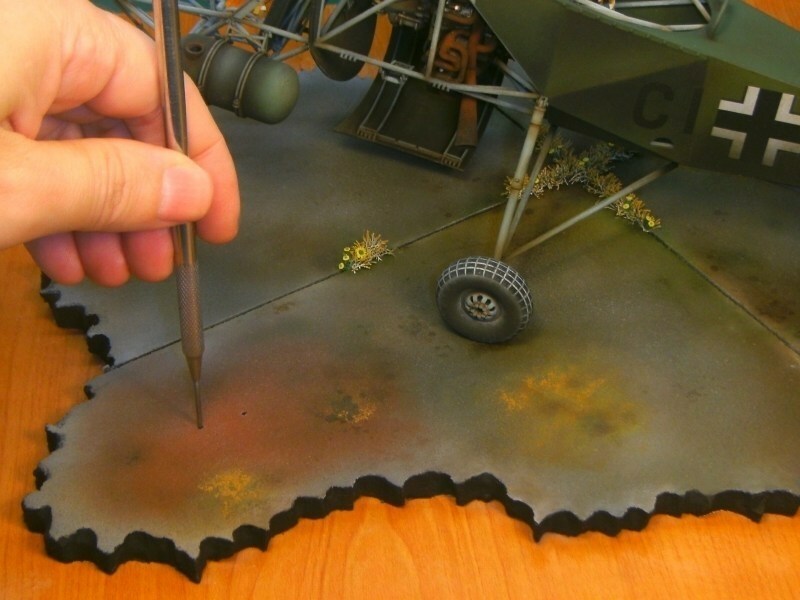 Although the model paint gets glossy after Winsor & Newton’s fixative applying, the good news is that model can be sprayed over with final matte coat after securing pigments with Winsor & Newton’s fixative, without leaving disastrous spots or milky stains on model (as usually happens when applying matte coat over modeling fixer-sealed pigments). 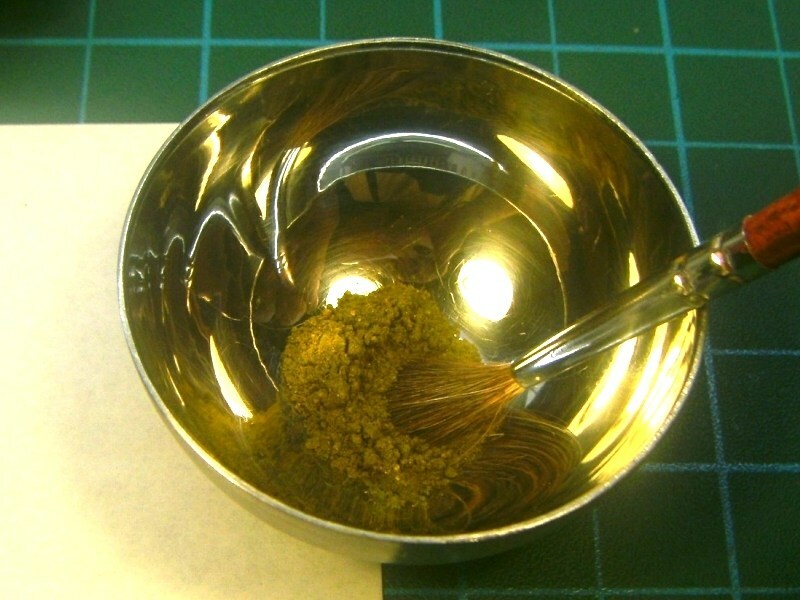 Once the Winsor & Newton’s fixative dried, the (glossy) outcome had tonality differences because pigments applied earlier and looked like been faded by the sun, fouled by dust and stained by fuel & oil. 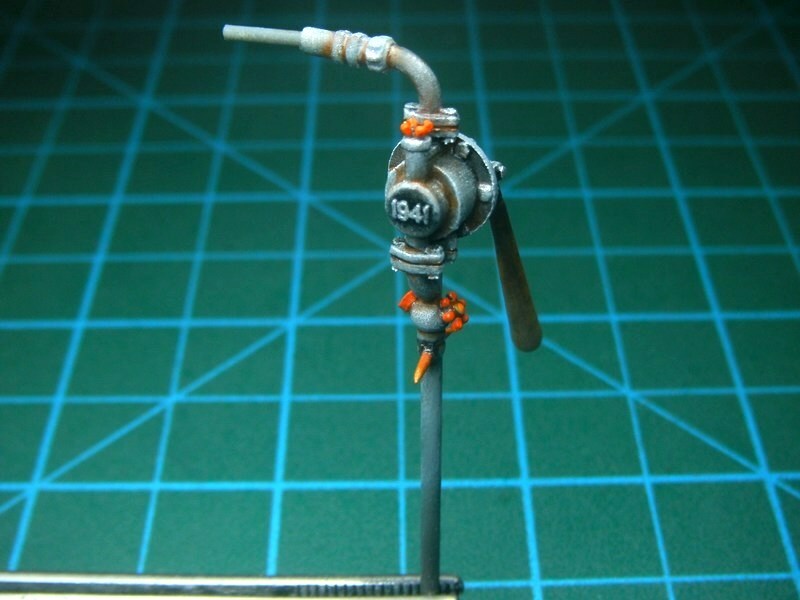 As previously mentioned, the glossy look is not actually a problem, since the model can be sprayed over with final matte coat later, while keeping all the pigment shades. 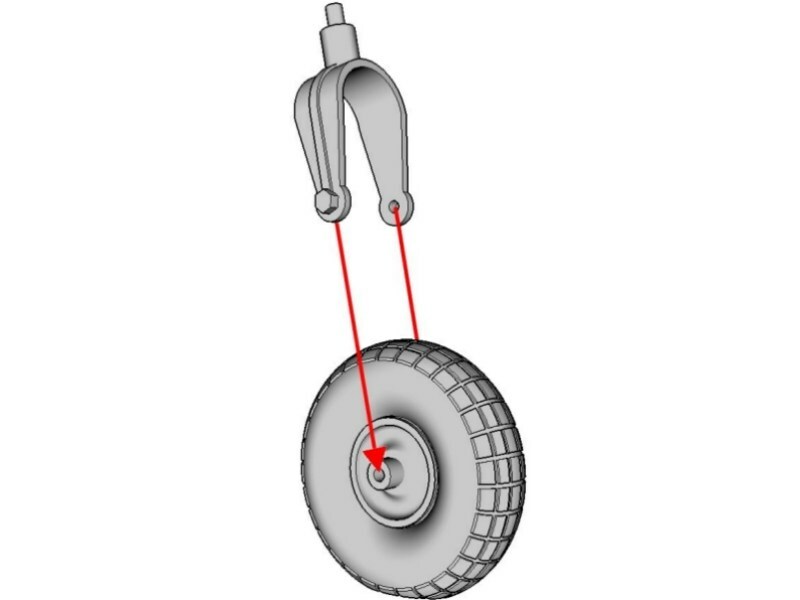 The wheels attached on undercarriage, according instructions described into the building manual. 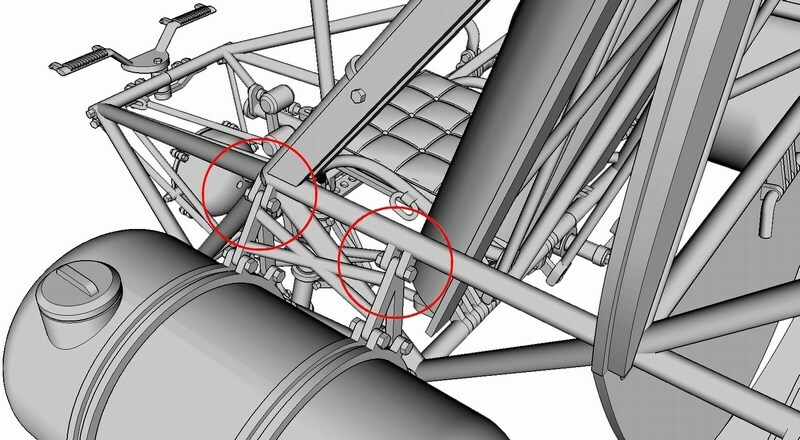 The U-shaped nose wheel supporting fork, pinned into the shock absorber slot while making sure that axes are aligned, as shown in following picture. 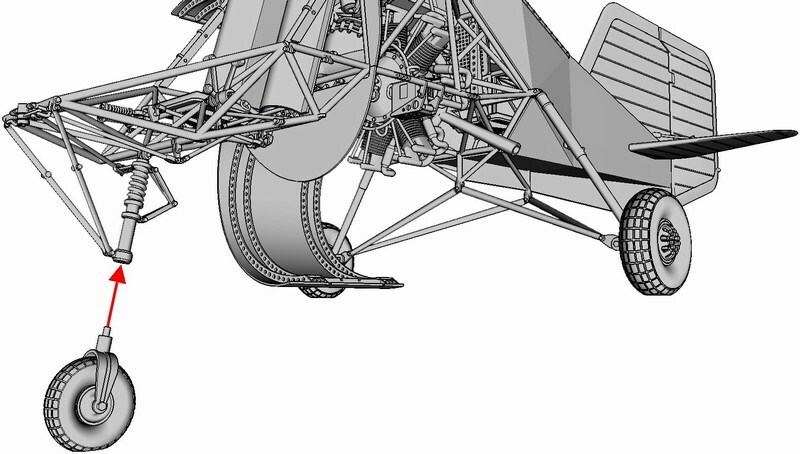 Notice that nose wheel is tilted accordingly to the rudder fin (which is already installed) as previously explained. 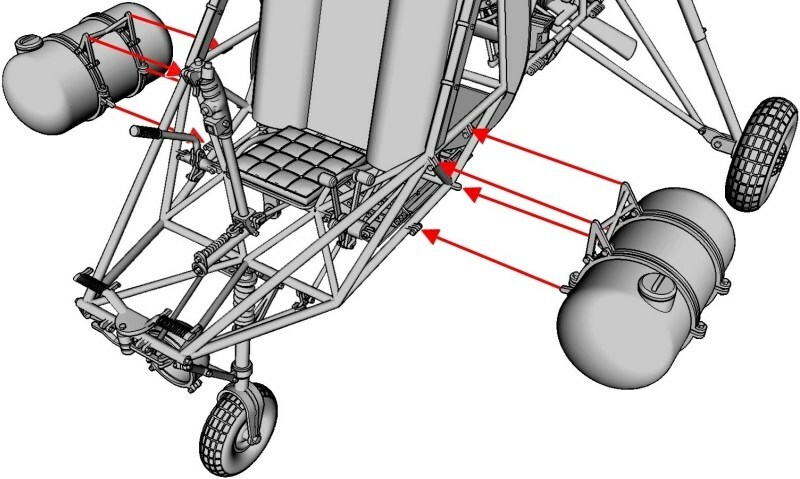 The twin 25 litres cylindrical fuel tanks (mounted externally on both sides of the pilot seat), attached on frame by plugging pins into proper slots as shown on the following pictures & secured in place with cyanoacrylate super glue. 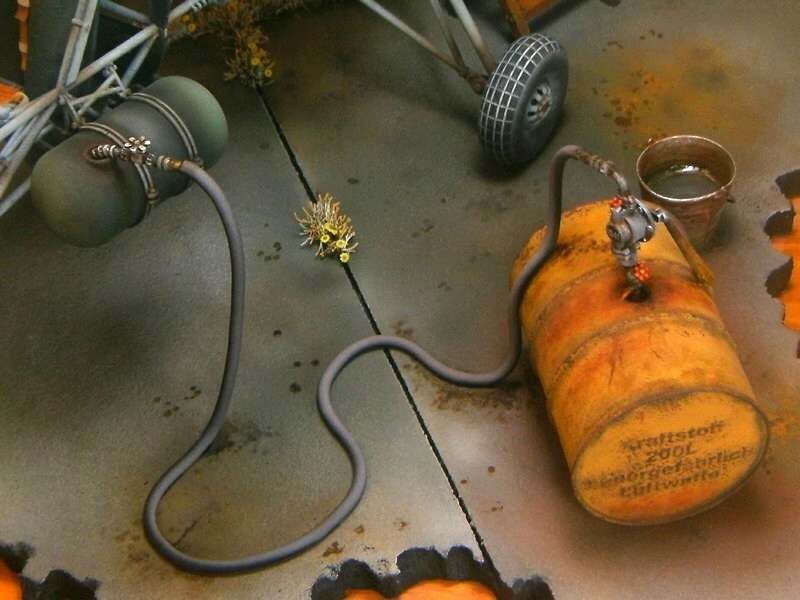 Since these cylindrical fuel tanks are made hollow, the sealing caps can be removed if building a refueling diorama scene. 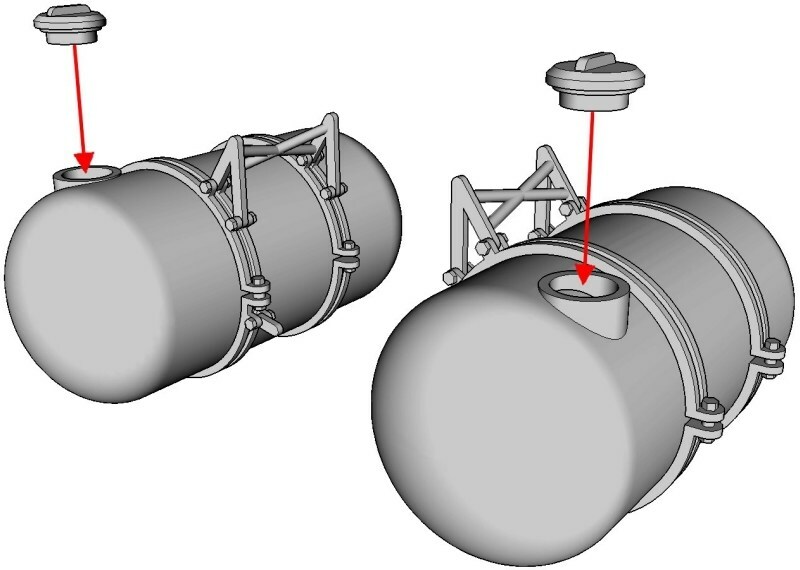 Notice the details marked into the red circles - this is how the cylindrical external fuel tanks should look like when correctly mounted externally on both sides of the cockpit area framework. 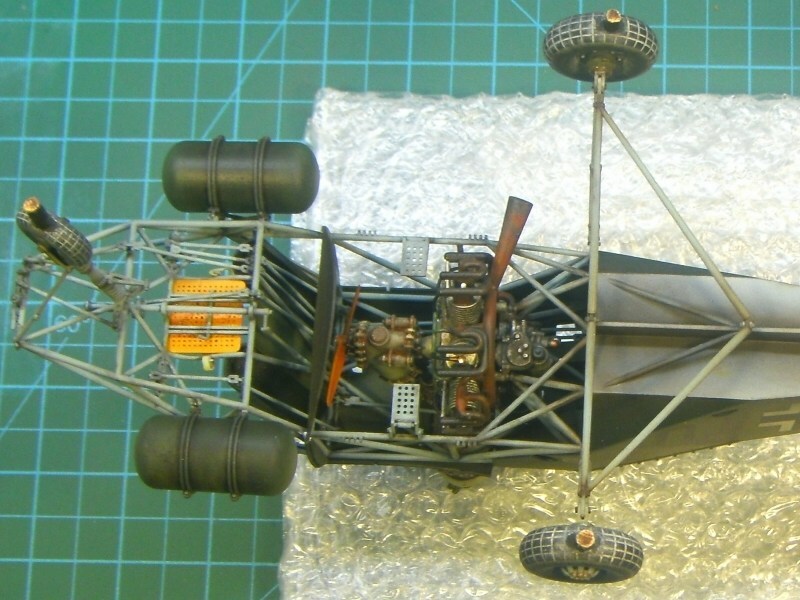 Here is how a semi-built “full fuselage” scale model kit version looks like as seen underneath, after few of the kit parts installed. 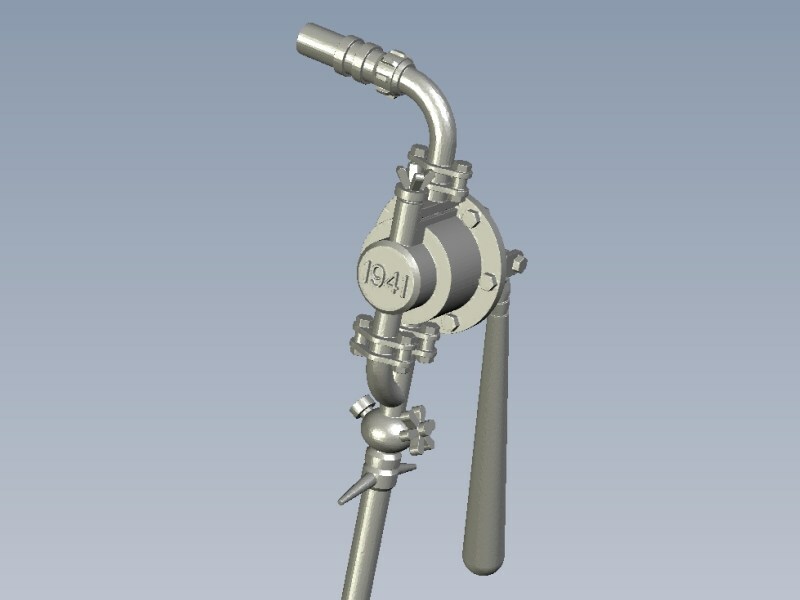 More parts such as the side & lower fuselage door panels, the rudder pedals & control levers in cockpit area, the instruments panel, the rotor heads & blades etc, will be attached on main frame later. 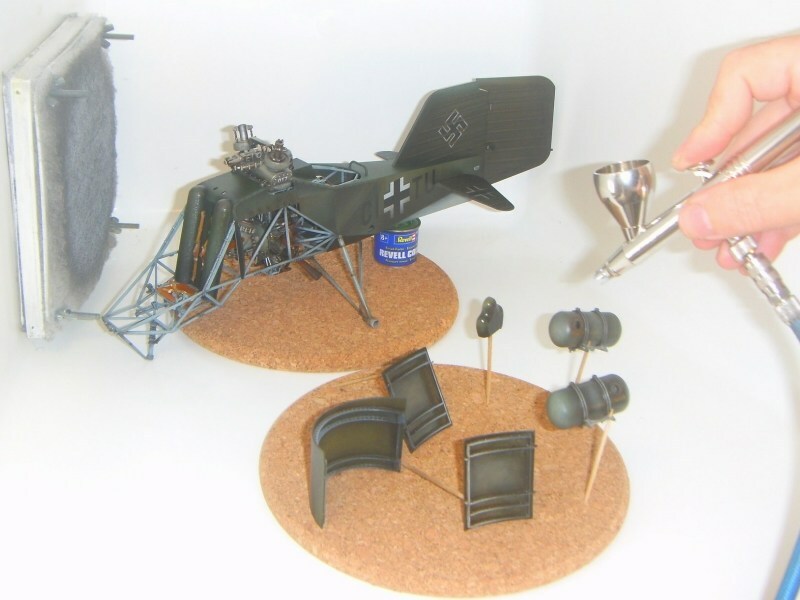 When I started this Kolibri project for a collector located in Kiel, Germany and later built more identical helicopters for other customers and my own collection at home too, I was concerned about a proper display option, on which the model would be placed. 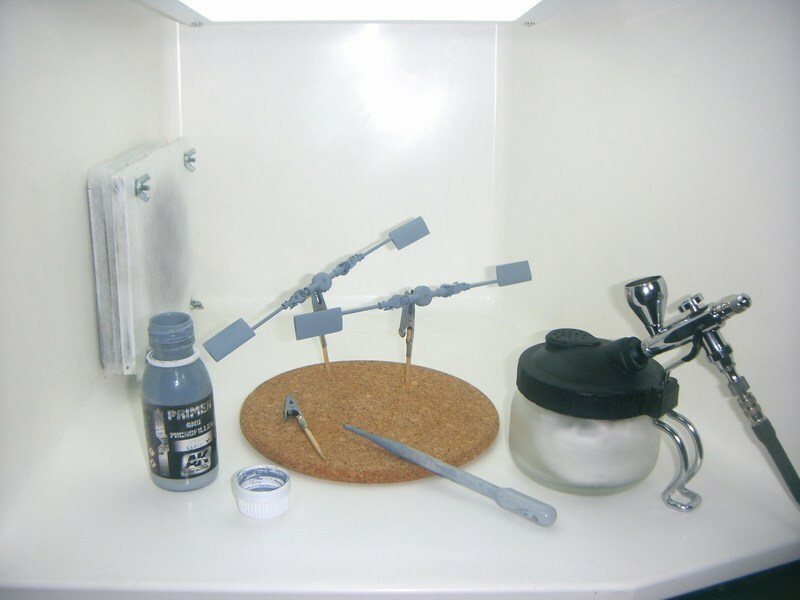 My goal is to build up a simple diorama scene, which looks like a “maintenance & refueling area” on a forwarded airfield. 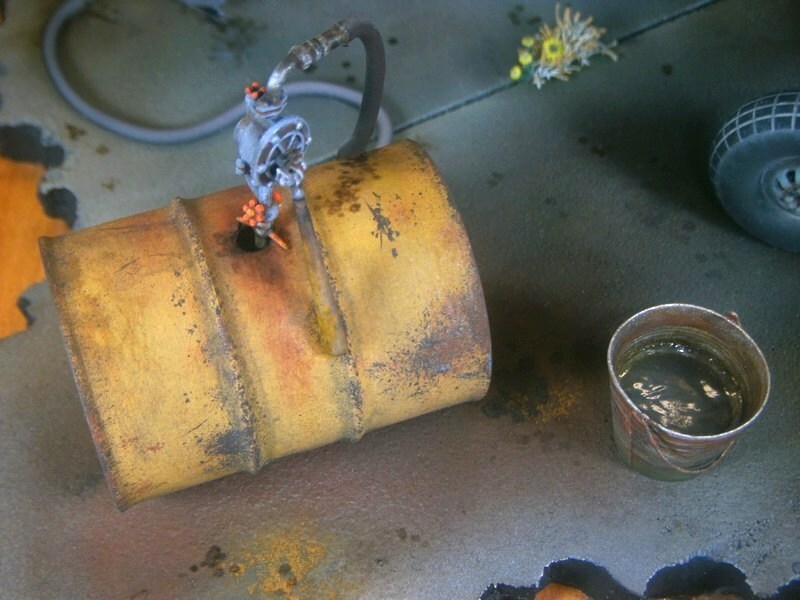 From an artistic point of view, a “maintenance & refueling area” scene might possibly dictate everything to be into a state of complete engine oil ‘n’ grease messiness. My goal is to keep the Kolibri helicopter as protagonist into the scene, while filling the empty space with few “maintenance & refueling area” related items, to maintain a visual balance. What I am actually trying to present here, is an intentional setup to show scale model’s details through opened maintenance panels, opened hatches, removed engine unit etc without extreme diorama action, nothing that could possibly distract viewer’s attention from the Kolibri helicopter which is always the main protagonist of the story. Any other item should be standing as an uninvolved walkon to simply complete the directorial picture. 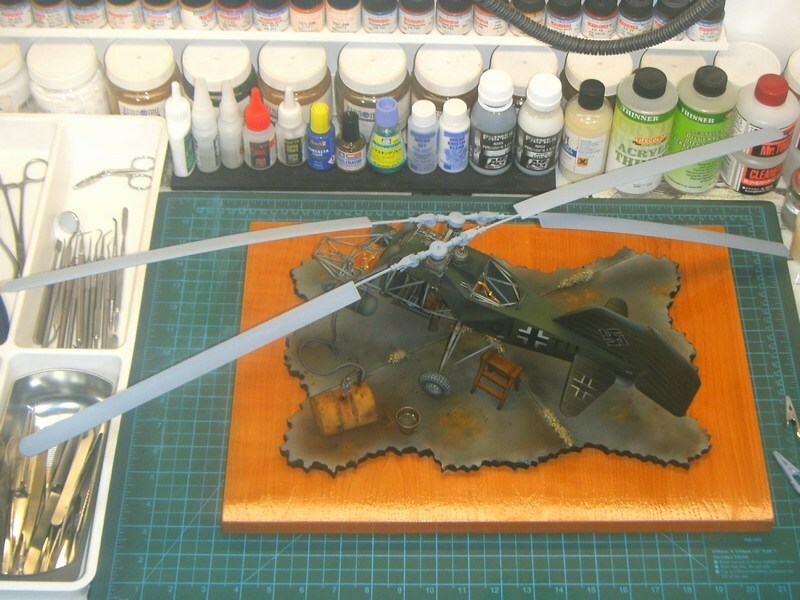 While scale model painting was underway, I thought as good idea to place the Kolibri helicopter scene on a “grass airfield” area. 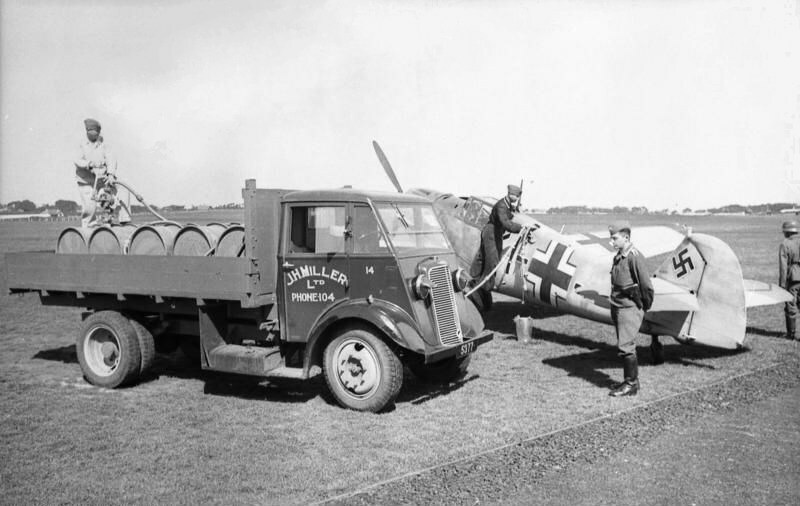 My opinion had been probably shaped (aka influenced) by viewing WWII era pictures, where the Flettner Fl-282 V21 Kolibris were stationed on the fresh green grass. Unfortunatelly, the problem that would arise from such a choice, is that the (already painted green) helicopter would be visually lost into this greenish backround. 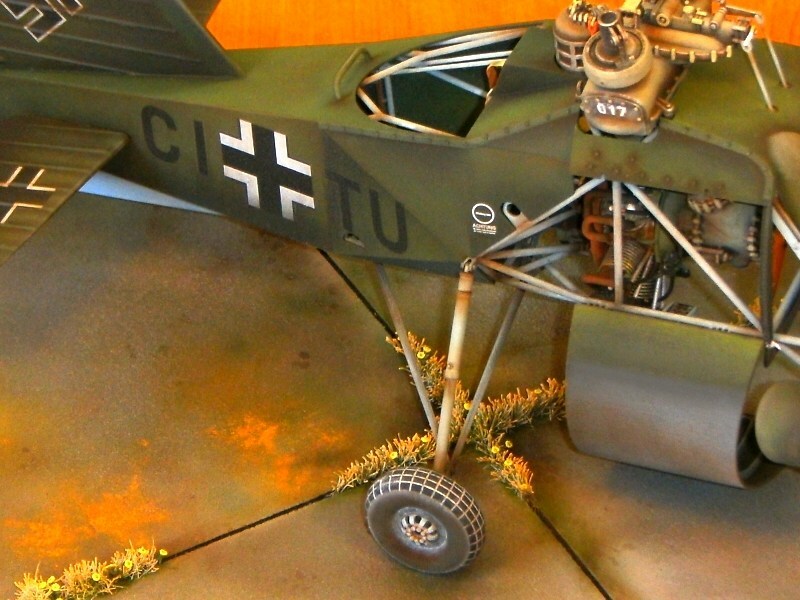 Due this reason, the idea of placing the Kolibri model on grass abandoned and the idea of a concrete covered airfield apron area (with just a few short grass sprouted between concrete slabs) where pre-flight activities were done, seemed much better. 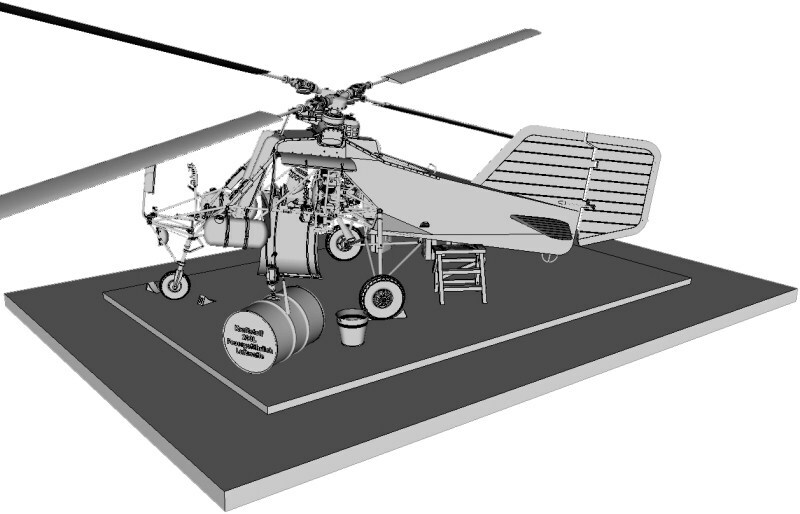 The scene would require at least a 450 x 350mm display base, considering that helicopter measures approx 357mm long and 138mm wide, without counting the rotor blades with disc diameter approx 700mm each. Those who have read my previously uploaded projects, might remember that I prefer using plaster powder to build the section that recreates the ground, especially if it is asphalt. 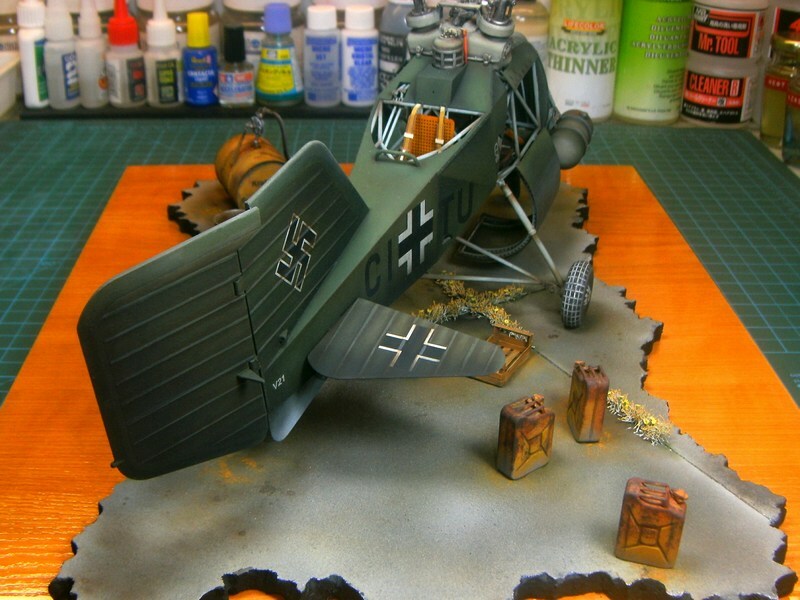 However, the 450 x 350mm dimensions of the scene dictate plaster quantity more (and therefore heavier) than usual and for this reason I chose to use another material, because the goal was to build a airfield display base instead of weightlifting equipment for champs. 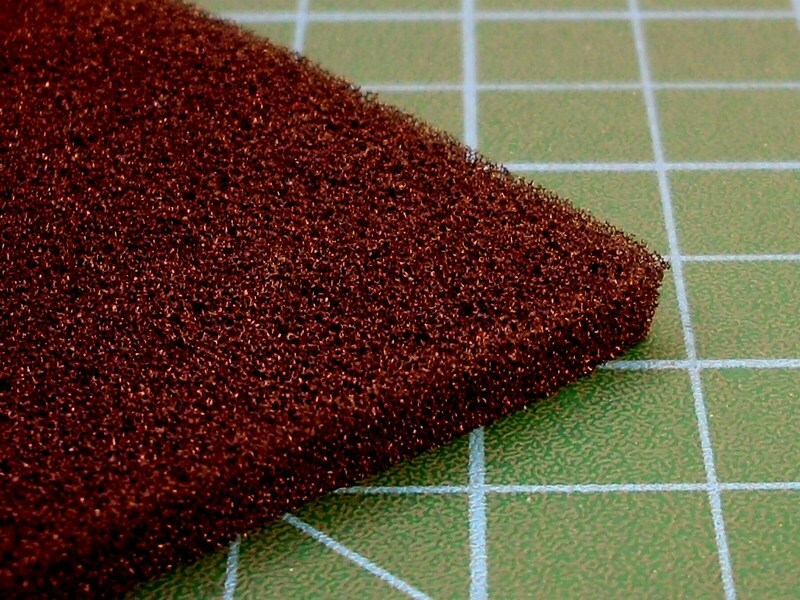 For this reason, I decided to follow a different way, by replicating concrete covered airfield apron with cork sheet. 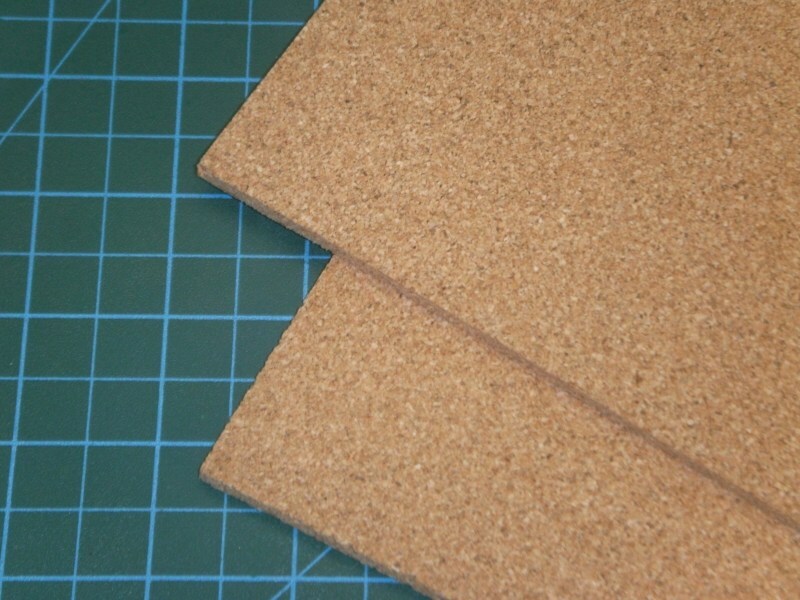 I purchased two 500 x 500mm sized & 4mm thick sheets of cork from my local hobby shop, which I cut & shaped around with my Black & Decker 400W / 3000spm jigsaw. 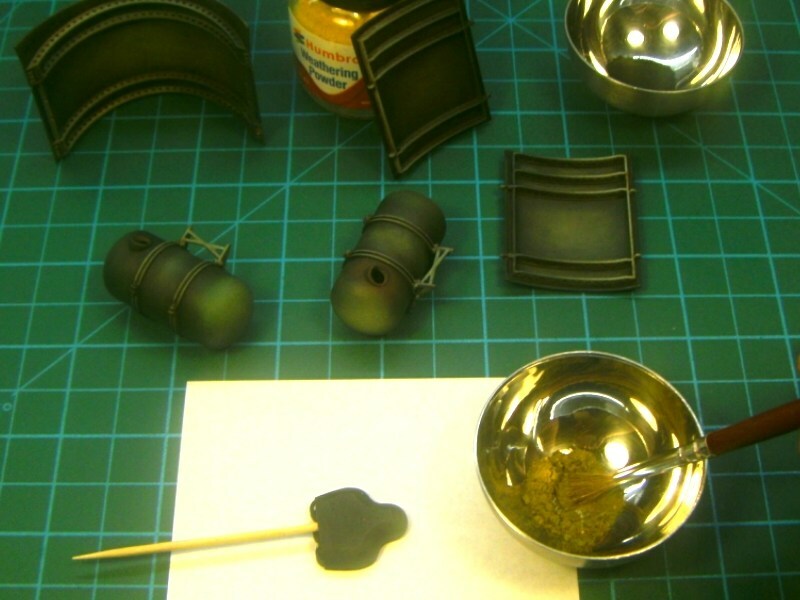 The basic idea, is to build an approx 8mm thick & flat surface which protrudes above the polished wood display base, on which short vegetation (grew between the concrete slabs) and diorama accessories (such as maintenance tools, fuel canisters etc), will be added later. 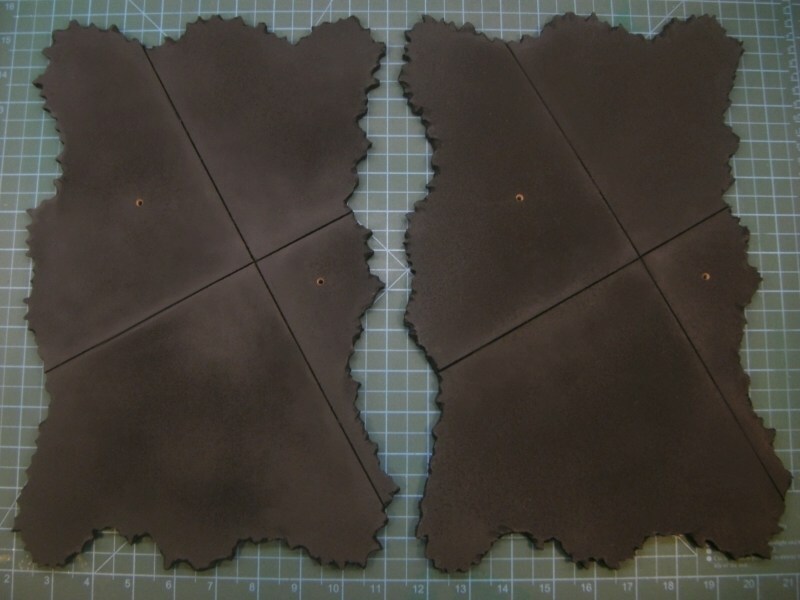 As soon as the 4mm thick sheets of cork identically cut into shape, sandwitch glued and the concrete plaques were lined, I used my airbrush to paint it. As I usually like to do, three different acrylic paint layers were applied on the concrete apron surface. First, mat black colour covered the area and then lighter greyish and earth layers applied, while airbrushing in almost zero degrees angle, to let the darker areas between the concrete plaques remain naturally dark. 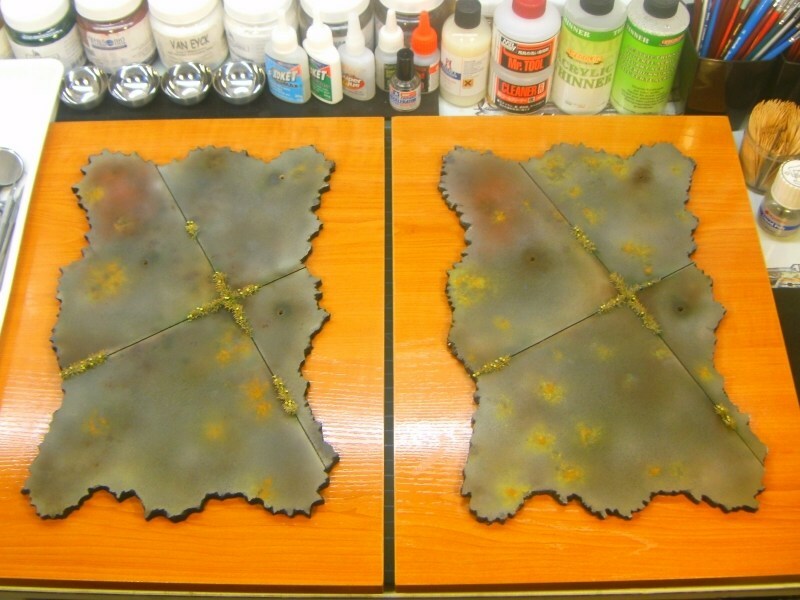 The concrete apron surface was paint with different greyish & earth tones and as soon as the acrylic colours dried, I tried some drybrushing on selected spots using sand tones. 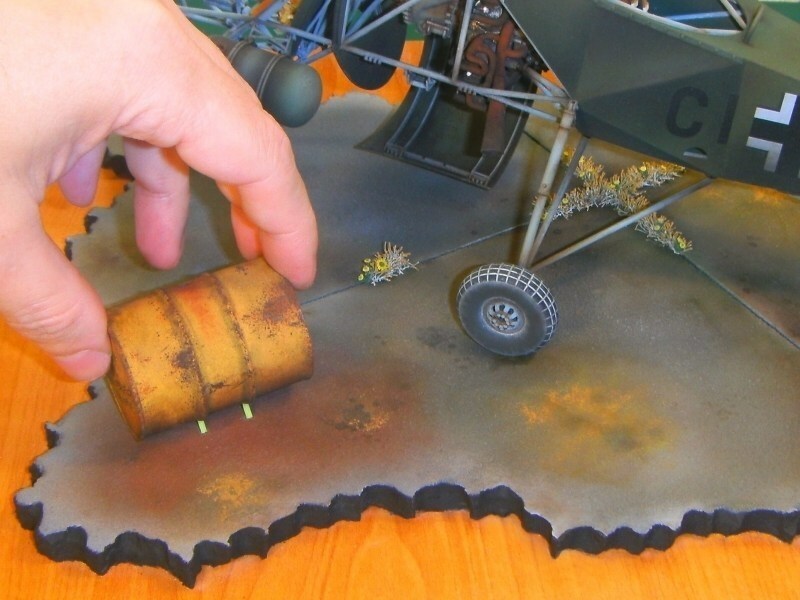 Concrete areas on which the oil drums, the fuel canisters, the under maintenance radial engine etc will be placed later (probably resulting oil & fuel stains on ground), painted differently with more yellowish shades to replicate sawdust spread to absorb leaked oil & fuel. As for the vegetation that grew between the concrete slabs, I used some Heki static grass, secured in place with water based white glue for wood which becomes transparent when it dries. When it looked OK to me, I sprayed over with Humbrol enamel matte coat, to seal the paint & vegetation result so far and left it overnight to dry. 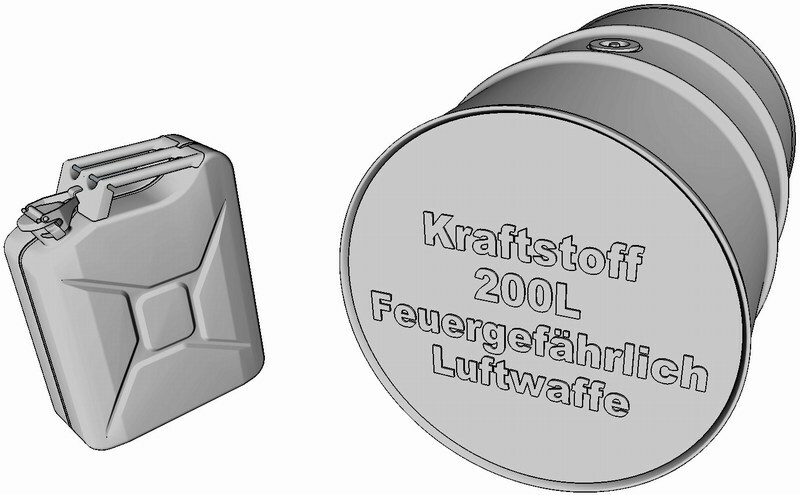 Meanwhile, some of the earlier described 3D printed items (unrelated to the helicopter structure) such as few 1/18 scale 20 litres fuel canisters, one of these 1/18 scale 55 gallons oil drums and one of these 1/18 scale 200 litres fuel drums as used by Wehrmacht, Luftwaffe & Kriegsmarine during WWII with “Kraftstoff 200L Feuergefährlich Luftwaffe” & “Kraftstoff 20L Feuergefährlich 1941” inscriptions engraved or embossed on side, also got some paint, dirt & weather effects. 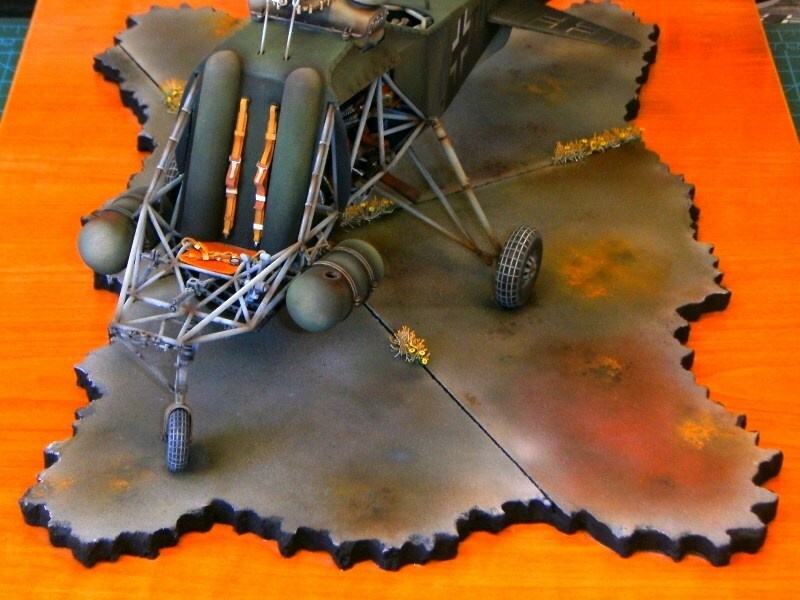 All the above mentioned diorama accessories are listed into Anyuta 3D products catalog and available for sale under various scales and sizes. 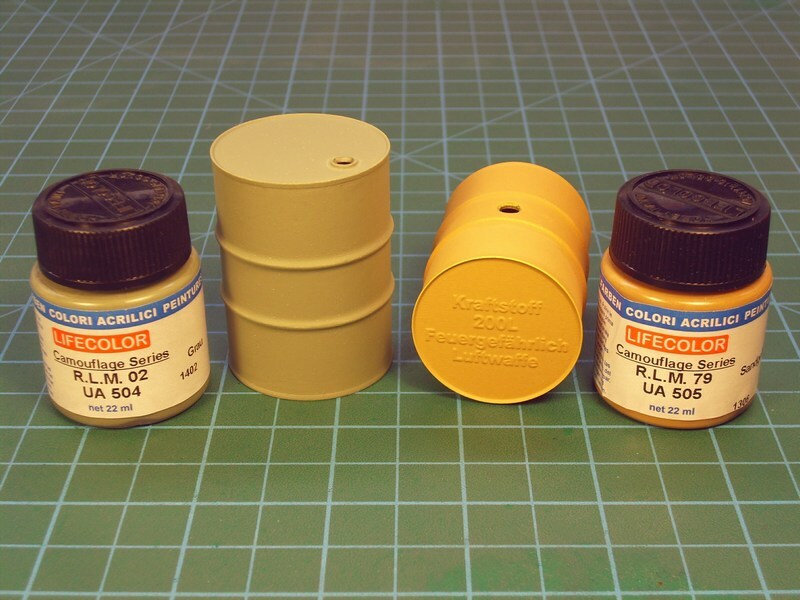 The previously mentioned 1/18 scale 200 litres fuel drum received a basic layer of Life Color UA505 RLM 79 Sandgelb II / Sand Gold II acrylic paint and the 1/18 scale 55 gallons oil drum painted with Life Color UA504 RLM 02 Grau / Grey acrylic paint and allowed to dry overnight. 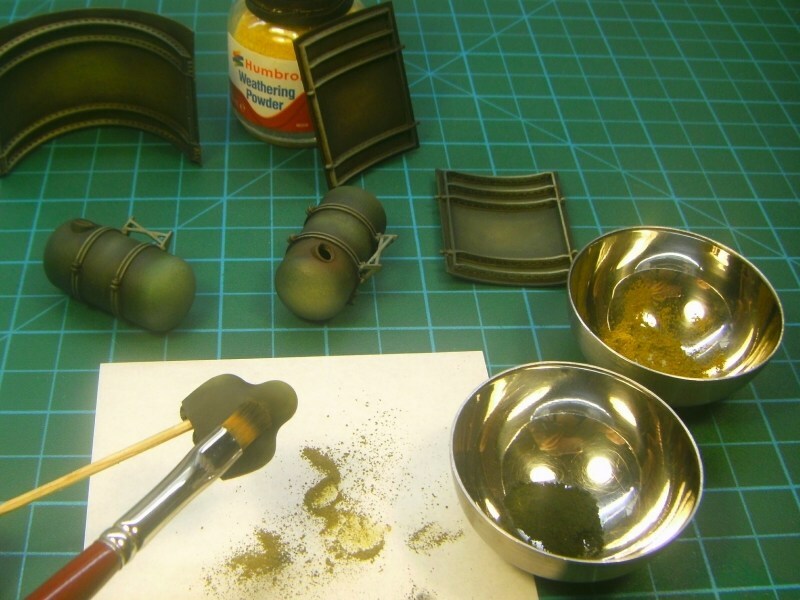 Once the acrylic base coat has cured, both drums got some weathering, paint scratches and rusty chipping effects while using the sponge technique to give visual interest to the base colour. 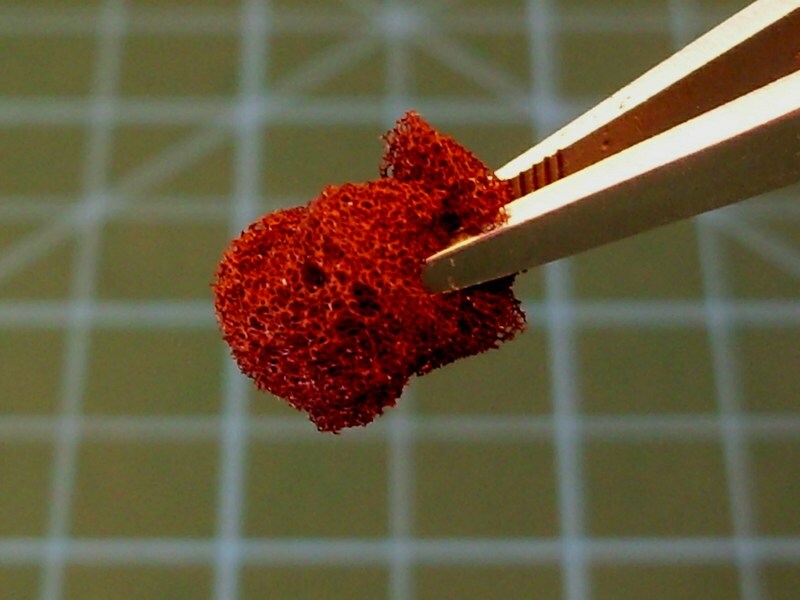 To achieve best results, I did use a fine textured sponge like those used for packing of electrical items. Fresh rust marks also added in some selected points, with some of the Life Color UA704 Rust Light Shadow 2 acrylic. 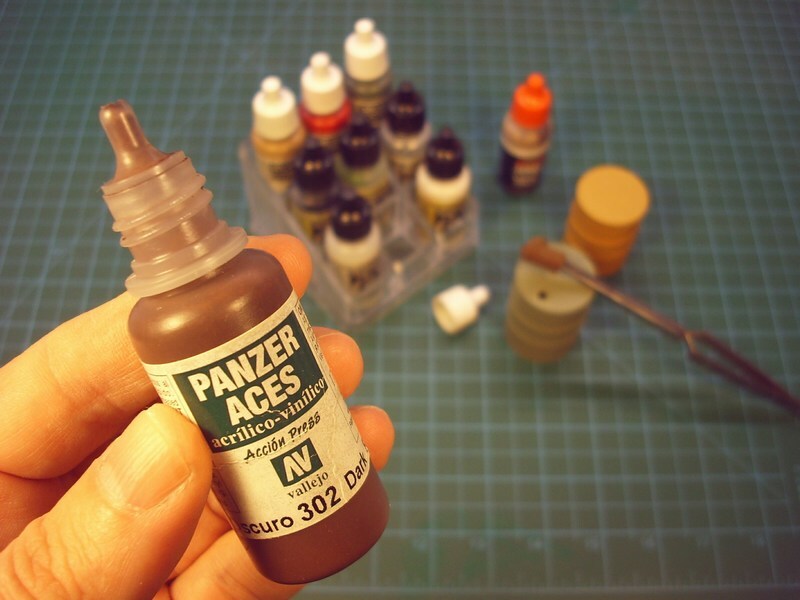 Using a fine tipped brush, the Light Rust Brown & Dark Rust oil paints by 502 Abteilung & AK Interactive series painted in vertical lines from various chips and scratches added earlier. Once the oil paints had been allowed to dry for a short while, a brush dampered in White Spirit used to blend and soften these streaks for a more subtle effect and obtain visible signs of wear & oxidation. Just amazing work, loved reading it over a cup of coffee, looking forward to the finale - thanks for sharing! The helicopter model secured in place, by wedging the pins under the wheels into holes that had been already opened on concrete (that's the reason wheels had pins underneath). 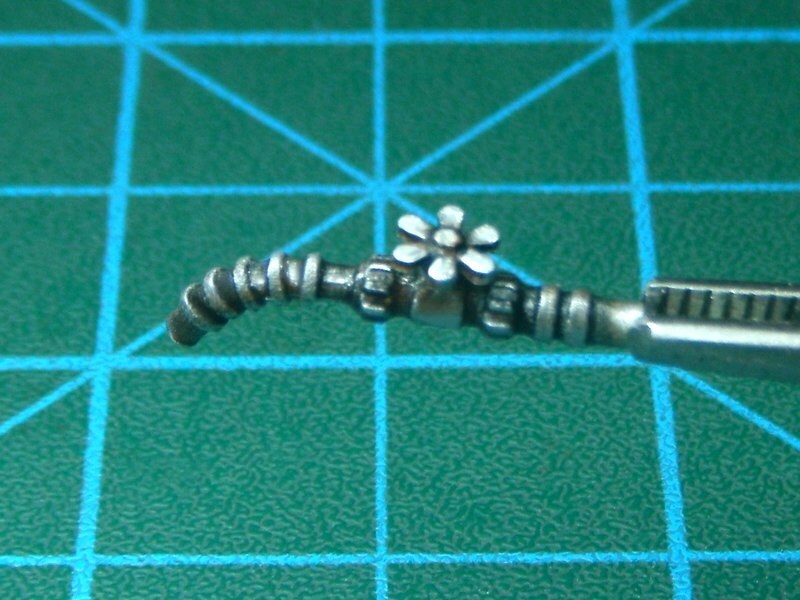 Once the Kolibri placed on display, each one of all these previously mentioned 1/18 scale items & diorama accessories also secured on ground with hidden metal pins and glued with transparent silicon. 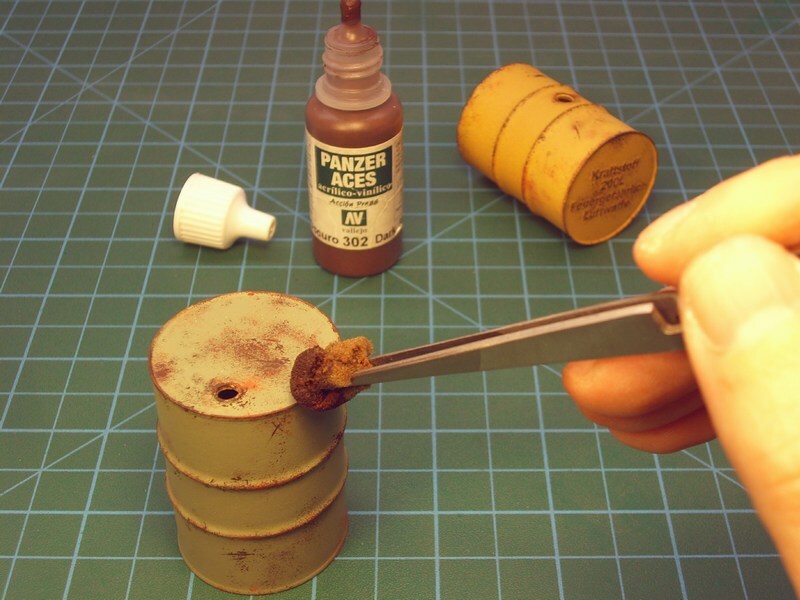 Finally, few more “maintenance & refueling area” related items (such as one 1/18 scale WWII era fuel hand pump, a set of 1/18 scale wheel chocks, some 1/18 scale wooden crates and a couple of 1/18 scale water buckets) also prepared to be placed on concrete display base. 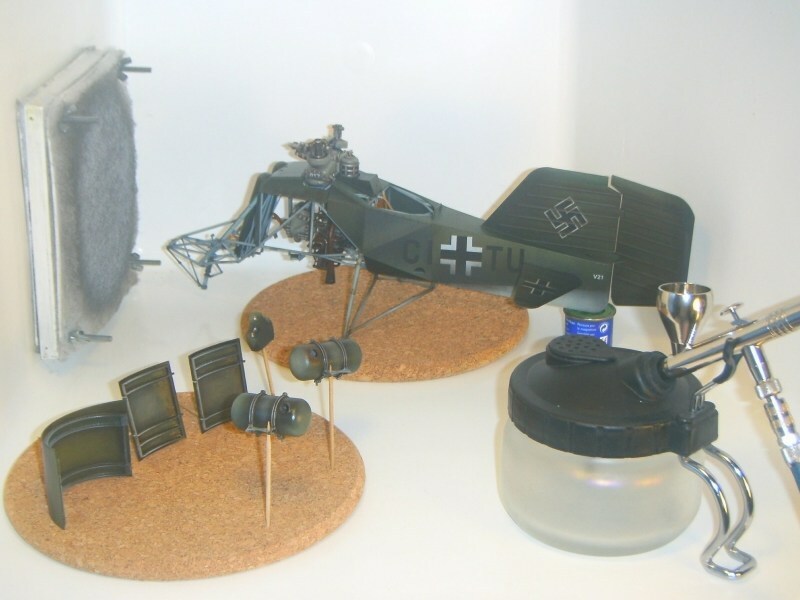 A last moment’s addition, an also 3D printed 1/18 scale WWII era Fahrrade M30 reconnaissance duty bicycle model, prepared for the diorama display. Wow, looks like it's floating in a sea of lava there Nick! Beautiful results though. Been long time since last visit, huh? 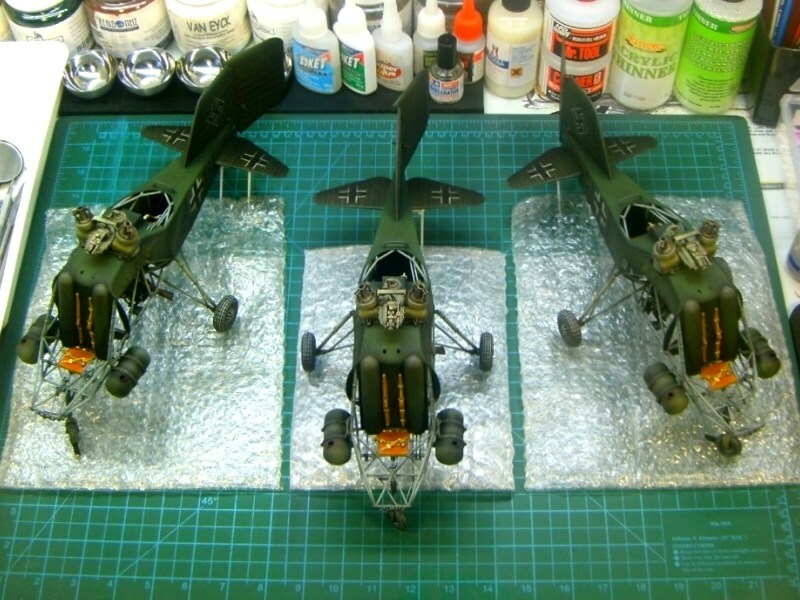 Well, let's remember some hobby fun again. 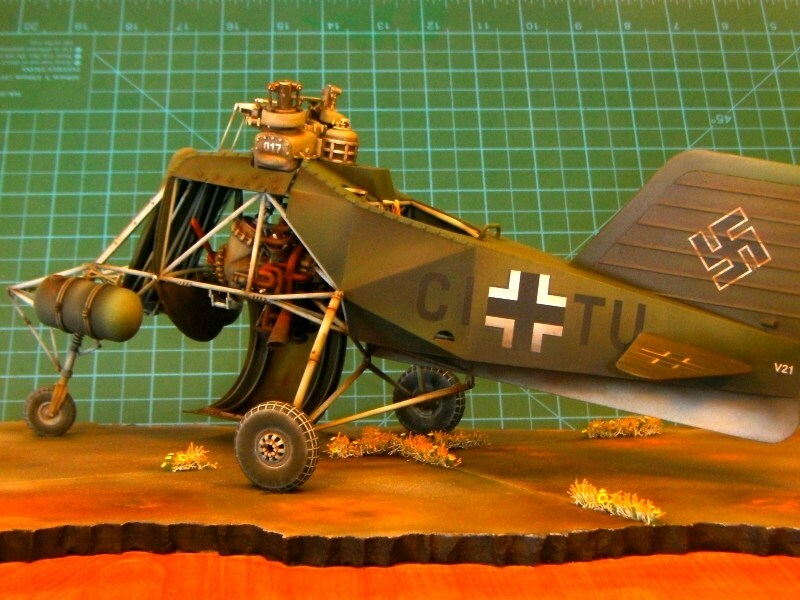 A second for the cutaway version of the 1/18 scale Flettner Fl-282 V21 Kolibri model kit. 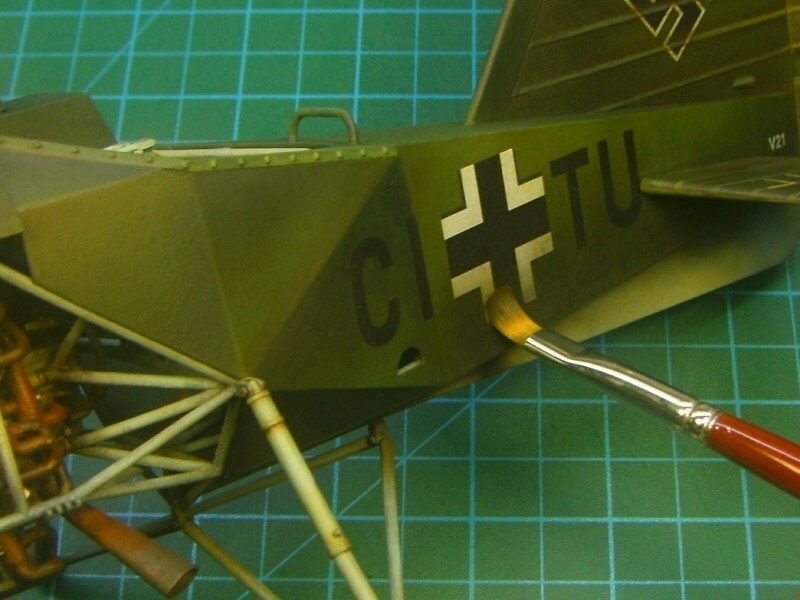 According to plan, both of them would include few additional features without distracting viewer's attention, keeping the Kolibri helicopter as the main protagonist of the story. 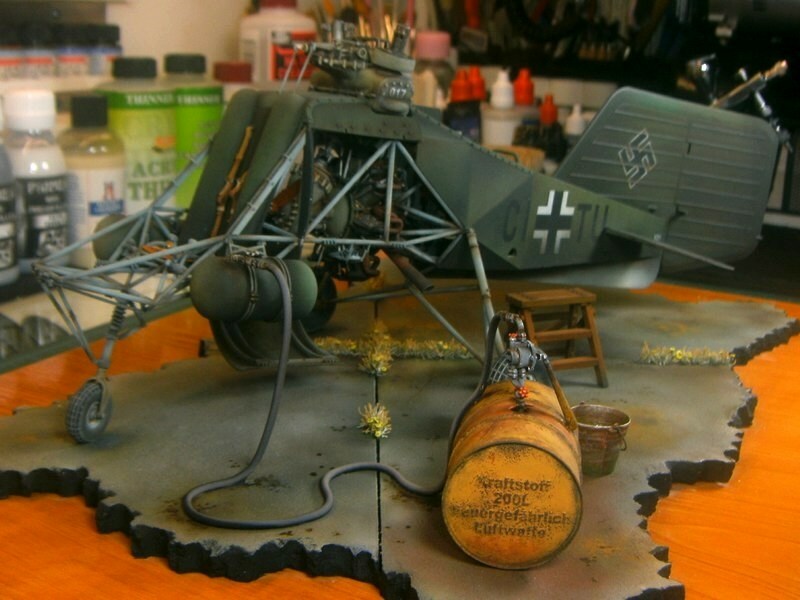 Starting with the full fuselage version, the addition of a WWII era Luftwaffe's 200 litres fuel drum with a handpump attached, few 20 litres canisters and a filled bucket left on ground, seemed good idea to me in order to present a short refueling scene. Rivet counters may say that the presence of a 200 litres fuel drum right next to the helicopter may look unreal or “too much”. Well, considering that the twin seat Fl-282 V21 helicopter had two 25 litres cylindrical fuel tanks mounted externally on both sides of the pilot seat (while the main 105 litres fuel tank installed on previous versions removed to host observer’s rear seat), a number of only 2 or 3 fuel canisters could be just enough to do the job. 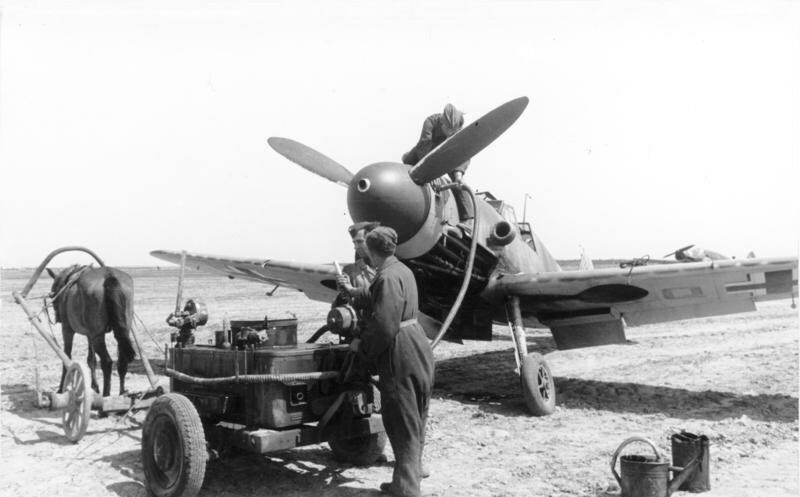 I am not sure about the official refueling procedures followed by Luftwaffe for the Kolibri helicopter during operational conditions & which were the appropriate method followed by engineers & maintenance personnel. 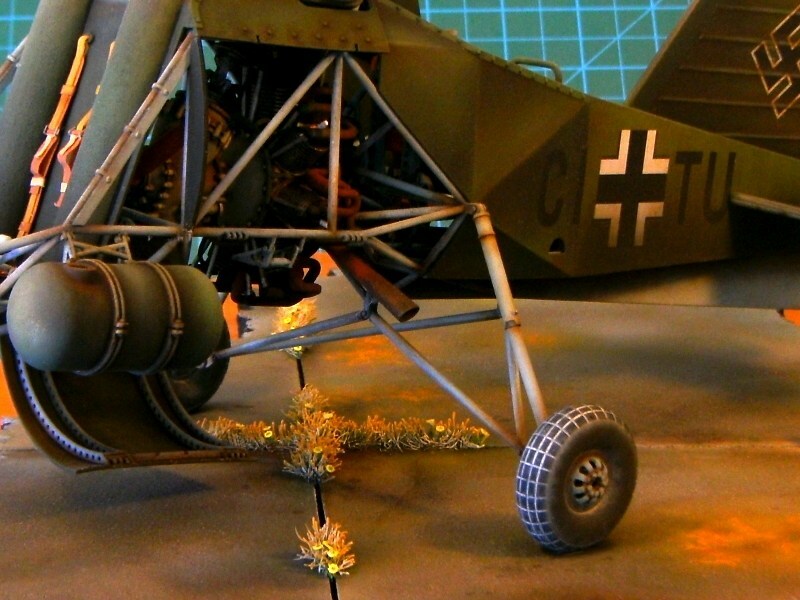 Did they park the Kolibri close to area where 200 litres fuel drums stored and later pumped fuel directly into helicopter’s tanks through a hose? Did they move (carrying on a truck / cart) the 200 litres fuel drums next to the helicopter’s parking area and later pump fuel inside tanks? 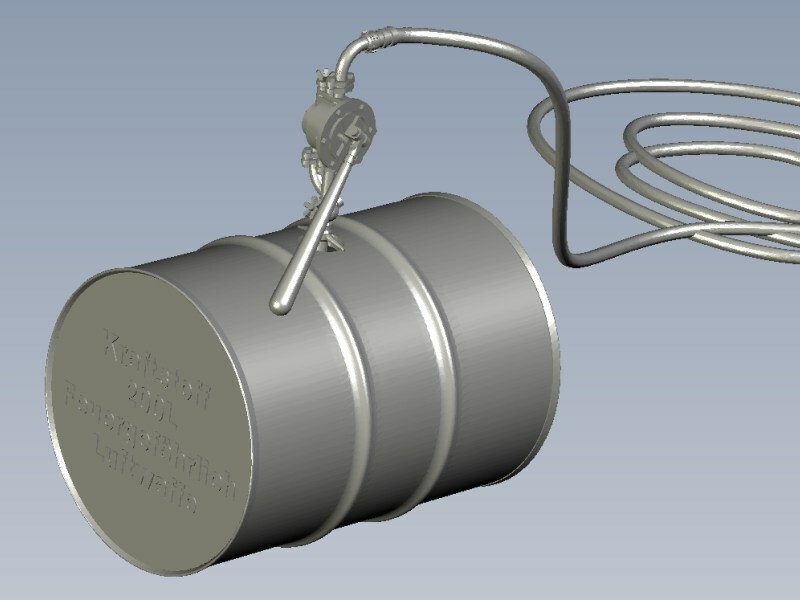 Did they fill helicopter’s tanks with hand-carried smaller 20 litres canisters & funnels, brought from main fuel storage area, next to parked Kolibri? IMHO, all the above (and many others) sound quite possible scenarios. 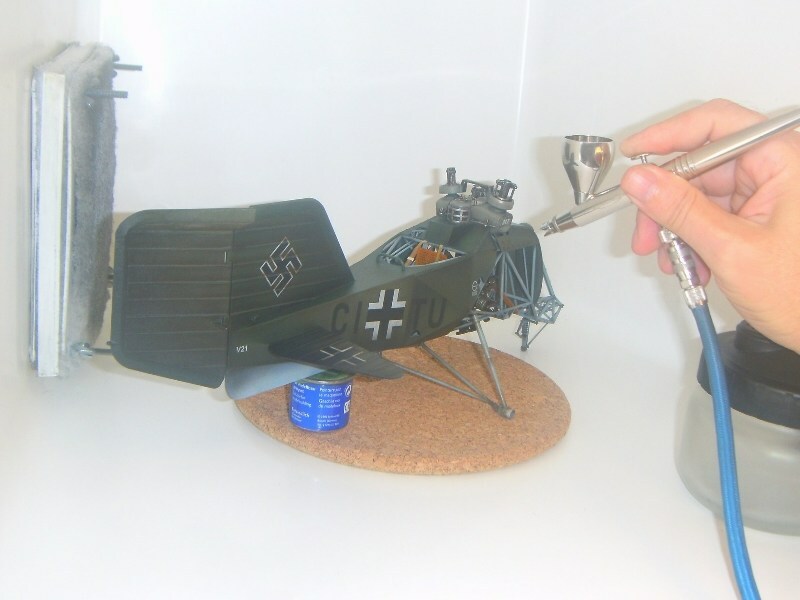 Since we all have seen WWII era pics showing airfield ground personnel using a big variety of methods, from operating Opel refueling trucks, to mule / donkey driven carts or poor maintenance personnel carrying 20 litres canisters by hands, I think that having few 20 litres canisters left into the diorama scene and same time a 200 litres fuel drum feeding the helicopter tanks directly through a hose, could be considered as realistic and not just an “artistic accepted” option. 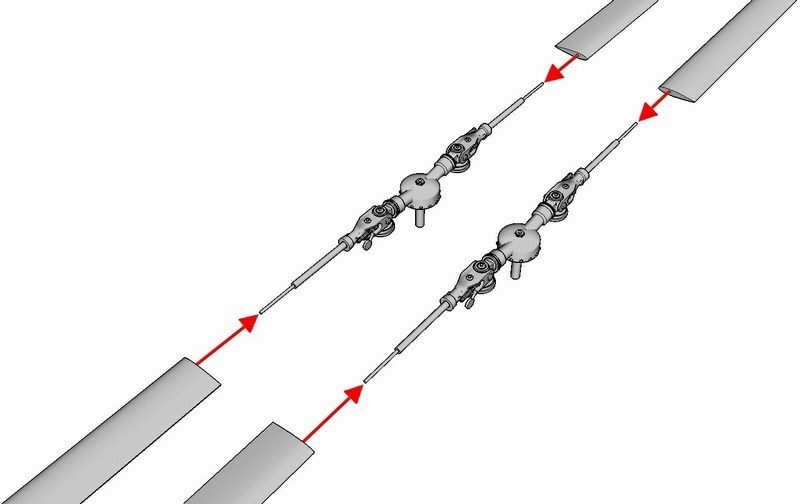 Meanwhile, the rotor blades for both versions attached on their rotor heads as described into the building manual (click HERE for the PDF formated file) through pages #88 to #94. 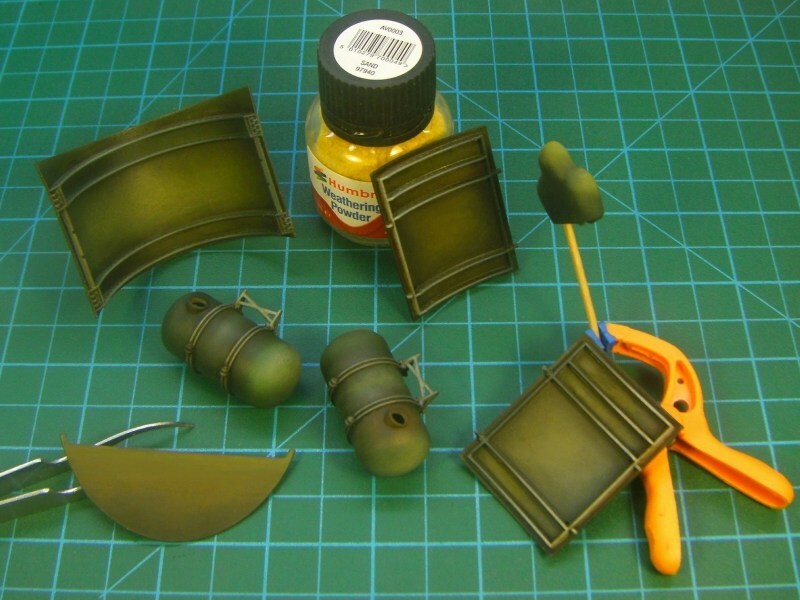 Parts sprayed over with AK interactive AK768 primer to spot mistakes and prepare for paintjob. I did a visual inspection and shot some pictures. 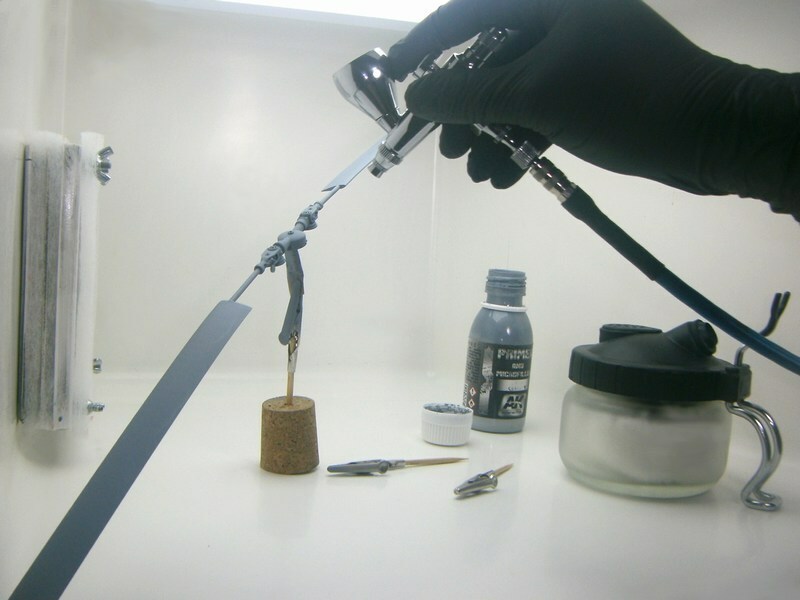 After overall primer, rotor blades dry fit tested to ensure that all individual components could be later combined together as an overall built model. 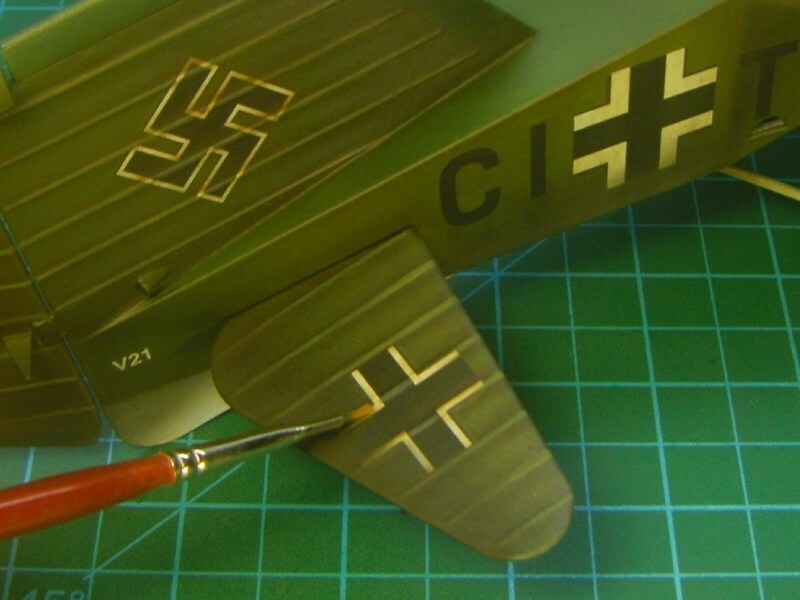 I admit that it’s not easy to handle Kolibri scale model and find best angle for photoshoot on bench, while having the rotor blades (measuring approx 70 cm from one wingtip to the other) attached.